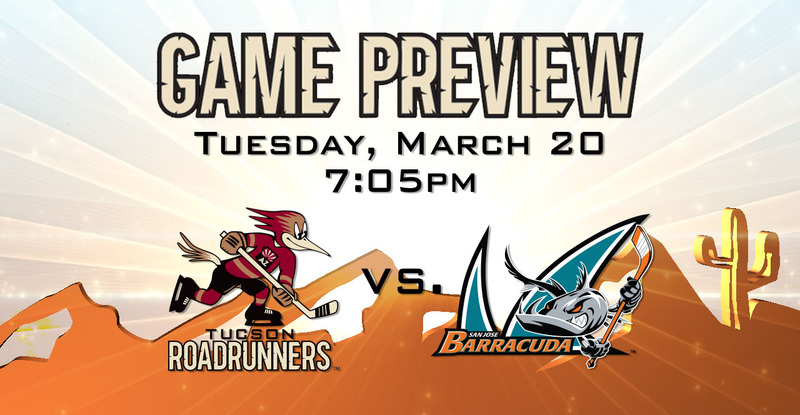 BARRACUDA BOUT: Tonight marks the sixth of eight meetings with the Barracuda this season, and the third of San Jose’s four scheduled visits to Tucson Arena. The Roadrunners are playing the first of a two-game home stand; they’re coming off of a 2-1 win over the Stockton Heat on Saturday. The Barracuda are playing the third of a four-game road trip; they’re coming off of a 5-4 overtime loss to the Ontario Reign on Sunday. AWAY FROM SJ: The Barracuda have won each of their two games played at Tucson Arena this season, picking up a pair of victories on December 12 and 13. San Jose, though, has only won 10 games away from home all season. They have dropped each of their last six games played (0-4-2-0) in opposing buildings, and are without a road win since February 2. EVEN OUT: Of the 11 teams the Roadrunners have played this season, the Barracuda are one of only two clubs they hold a losing record against, the other the San Diego Gulls (4-4-0-1). With a 2-3-0-0 mark against San Jose this year, the Roadrunners can claw back to an even .500 with a victory tonight. PROJECTED LINEUP: The team held a morning skate at Tucson Arena ahead of tonight’s game. Per club policy, specifics regarding the team’s lineup will not be published until 5:00 PM this evening. THE LAST TIME AROUND: In the teams’ previous meeting on February 14 at San Jose’s SAP Center, the Roadrunners fell to the Barracuda by a 4-2 score. Mike Sislo and Lane Pederson scored the Roadrunners’ two goals; San Jose scored three unanswered en route to their victory. Hunter Miska stopped 22 of the 26 shots he faced in the loss. 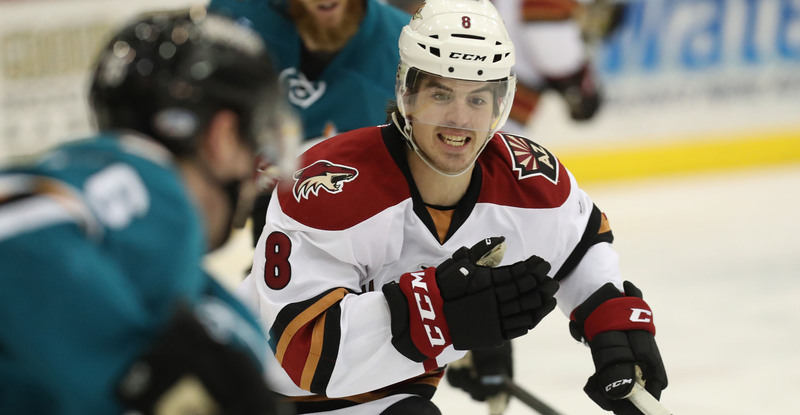 MAKING MOVES: The Roadrunners will be without forward Dylan Strome and defenseman Trevor Murphy tonight, the two players recalled to the Arizona Coyotes on Tuesday morning. Defenseman Jalen Smereck has been reassigned to Tucson from the OHL’s Flint Firebirds, and forward Zac Larraza has been recalled from the ECHL’s Fort Wayne Komets. Goaltender Marrick Madsen, who the Coyotes signed to an entry-level contract earlier today, will report to the Roadrunners. PLAYOFF PUSH: The Roadrunners enter the night with the second-lowest magic number in the Western Conference (14), behind only the Manitoba Moose’s 13. The Barracuda are on the outside of the playoff picture looking in, currently situated at seventh-place in the Pacific Division.